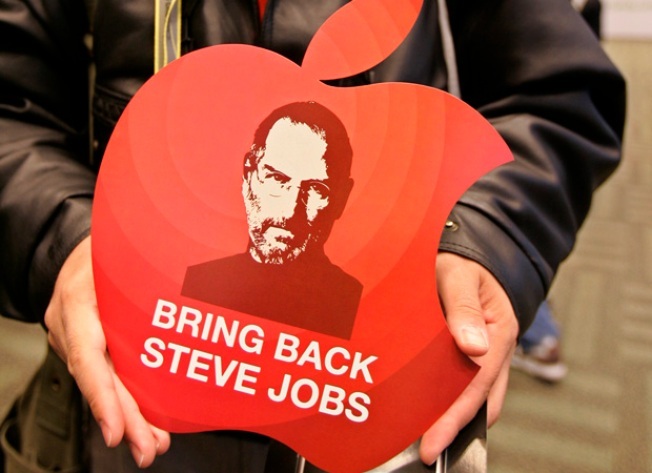 Conference attendee Sergio Miranda holds up a sign about the absence of Apple CEO Steve Jobs at the Macworld Conference and Expo in San Francisco, Tuesday, Jan. 6, 2009. Shares of Apple Inc. fell 2.29 percent Thursday as investors struggled to parse the latest disclosure from CEO Steve Jobs about his health and his need to go on leave until the end of June. The 53-year-old Apple co-founder, a survivor of pancreatic cancer who appeared gaunt last year, said Wednesday after the stock market closed that he is stepping away from his daily duties because his health problems have become "more complex." Apple's chief operating officer, Tim Cook, will take over. In contrast, as recently as Jan. 5, Jobs tried to assure investors and employees that he had discovered his weight loss was caused by a treatable hormone deficiency. In that statement, he said he had begun a "relatively simple and straightforward" treatment and insisted he would remain at Apple's helm. Jobs' reversal sent Apple shares sliding to one-year lows in extended trading Wednesday, but by Thursday morning they had recovered slightly, and were down $1.95, 2.29 percent, at $83.38. Apple's stock has surged and tumbled over the last year in step with rumors or news about the CEO's condition. While the top executive's health is an issue for investors in any company, at Apple the concern reaches fever pitch because Jobs has a hand in everything from ideas for new products to the way they're marketed. Last week, Jobs said his disclosure of his hormone problem was "more than I wanted to say, and all that I am going to say" about his health. It came on the eve of Macworld, the biggest Apple trade show of the year, at which Jobs traditionally delivered the keynote address to avid fans. In December, Apple said Jobs would not take the stage as usual, stoking more rumors and prompting Jobs' Jan. 5 letter, which he said he hoped would allow everyone to relax. The limited amount of information in that announcement and Wednesday's update left medical experts guessing. Some specialists said Jobs' past pancreatic cancer could be the problem, given the organ's role in digestion and nutrition. Apple's overall secrecy and its history of keeping information about Jobs' health under wraps is only increasing the speculation. The company waited until after Jobs underwent surgery in 2004 to treat a very rare form of pancreatic cancer — an islet cell neuroendocrine tumor — before alerting investors. That type of cancer is easily cured if diagnosed early, unlike the deadlier and more common adenocarcinoma. And last summer, Cupertino, California-based Apple insisted Jobs' weight loss was due to a common bug. The New York Times reported Thursday, citing two undisclosed people familiar with Jobs' condition, that Jobs was not suffering from a recurrence of cancer, but that his body was having trouble absorbing food. "They'll tell you the least they can tell you," longtime industry analyst Roger Kay of Endpoint Technology Associates said. "They're trying to have it both ways, to protect their guy's privacy and feelings and at the same time somehow signal the market." Cook, who ran Apple for two months in 2004 when Jobs was recovering from his cancer surgery, is seen as one of Jobs' most likely successors, along with Apple's top marketing executive, Philip Schiller. American Technology Research analyst Brian Marshall — who last week predicted Jobs would step down this year — said Wednesday's announcement tips the bets in Cook's favor.